Orlando, for most people, conjures up the image of theme parks, mainly Walt Disney World, but there are an endless amount of fun things to do in Orlando! (In fact, Disney World is not in Orlando, but is in nearby Lake Buena Vista). The region sees an estimated 52 million tourists a year, and downtown Orlando is developing significantly under this tourist boom. Other cities in the metropolitan area include Altamonte Springs, Davenport, Clermont, Kissimmee, and Winter Park. All great areas to stay and play while on your Florida vacation. Discover a variety of things to do, see and explore below throughout the Orlando area. From world-famous theme parks to outdoor activities, shopping, dining and more there is something for everyone! Imagine yourself surrounded by thousands of plants, exploring 80 acres of botanical gardens. No this is not Disney world-- These are the local gardens and parks in Orlando! Central Florida features come of the most remarkable gardens and parks ideal for the whole family. Explore the native green spaces and cultivated botanical gardens in the Orlando area and learn a thing or two about the local flora! With an average year-round temperature around 80 degrees, it is no surprise that Orlando is a major golf destination. The Orlando golf courses feature manicured greens and fairways with lakes, trees, and beautiful scenery. The Bay Hill Club & Lodge is even home to the Arnold Palmer Invitational each March. Grab your clubs and see our list of top Orlando golf courses and country clubs to plan your Orlando golf vacation today! Orlando is one of the biggest tourist destinations because of the nearby theme parks and resorts. Close to International Drive is Universal Orlando Resort, which includes two theme parks, three hotels and a large shopping district. SeaWorld Orlando is a marine theme park featuring Kraken, the biggest rollercoaster in the Orlando area, as well as Believe, the new Shamu adventure. About 35 minutes southwest of downtown Orlando is Walt Disney World. Comprising four theme parks, two water parks, dozens of hotels, two shopping and dining districts, five golf courses, and much more, it is the largest privately managed tourist destination on the planet. Not far from Disney World lies the Alligator Capital of the World: Gatorland. With an exploding music, arts, nightlife, and sports scene, savvy travelers are seeing Orlando as a multicultural option with top-notch museums. The area is filled with a large array of not-to-be-missed museums. With everything from historical museums to science centers to a Ripley`s Believe It or Not! odditorium, there is something for everyone! There are so many exciting places to go in Orlando with each neighborhood having its own local flavor. Known as a theme park destination, visitors will want to visit these up-and-coming cultural districts. Each neighborhood creates a unique sense of the diversity and personality that comprises this vibrant Central Florida metropolis. Orlando`s professional sports teams are attracting travelers to the heart of the urban center in search of a unique experience at one of the many sports complexes. The expansive sports scene offers sports enthusiasts endless entertainment. Football fans won`t want to miss the University of Central Florida athletics program. Also, while Orlando doesn`t have a major league sports team of its own, baseball fans can watch the Atlanta Braves during spring training at the Walt Disney World Resort`s ESPN Wide World Sports Complex. You can catch the team`s practice games at Champion Stadium in the same Lake Buena Vista sports complex located just outside of Orlando. Find more information on the local Orlando sports teams below. 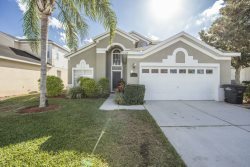 With warm weather year-round, tennis in Orlando, Florida is just one of the many outdoor activities ideal for staying active and taking advantage of the sunshine when at your vacation rental. Neighborhood tennis centers provide equipment, stringing services and apparel, so you don`t have to travel with your gear. Diligent practitioners are able to get their daily exercise and junior players build skills while parents are able to experience other venues in the area. If you are new to tennis or ready to take practice to the next level? The following facilities offer quality courts, as well as tennis lessons for kids and adults in the Orlando area. Contact us at Florida Gold Property Management to learn more about tennis facilities and availability during your visit to the Orlando area. With restaurants, golf and activities around every turn, Orlando is a great city for conventions, company meetings, and events. Your guest are sure to enjoy themselves at a convention or event in the Orlando area. We are happy to offer Orlando rentals close to various meeting and event spaces. Looking to host a large meeting or event in Orlando? The following resources can help you find the space you are looking for.